Basic Information: What is Attend? This is a review of the Växa’s Attend and should help customers decided whether or not to buy it. The product is a homeopathic medicinal formulated by doctors and is indicated to support attention difficulties. Its formula was designed to reduce stress and improve concentration. Attend is available for purchase in the company’s website and other retail outlets both physical and online. The recommended dosage of Attend for adults and teens is an initial intake of 3 capsules twice a day for 30-45 or as instructed by the physician. After that, 2-4 capsules should be taken daily for maintenance. Children must start with only 2 capsules a day (one in the morning and one in the afternoon) as a loading dosage and evaluate effectiveness from then on. If the desired results are not attained, one extra capsule in the afternoon can be added. It is advised to take the product 20 minutes before or after a meal. A bottle of Attend with 60 capsules can be bought at the manufacturer’s website for $40.69. Online retailers like Amazon offer discounts up to 30%, bringing the cost of a bottle to $26.60. No subscription service is available at the moment. Although instructions suggest that the product might take 30-45 days to start working properly, with me noticeable changes began to show in the very first days of usage. My attention span improved considerably within a week and there is a real boost in the energy felt in the morning and concentration throughout the day. After one month it was possible to feel a decrease in any signs of depression. Possible side effects when taking Växa Attend are nausea, headaches and insomnia. Some people might notice an increase in bleeding in case accident due to natural blood thinners in the product’s composition. If any of these symptoms occur, the recommendation is to stop taking the capsules immediately and contact a doctor. Växa keeps a return policy in which full refund is guaranteed for homeopathic products returned within 90 days of purchase. One opened package of the product, if bought in series, is accepted as long as the other are in their original condition. Shipping charges are non-refundable. 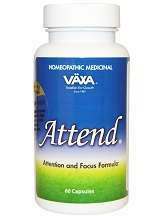 Attend helps improve concentration and attention span after only a few days of use, and its composition, made entirely of natural products, eliminates the danger of any medical interaction. In the other hand, the lack of proven track in its effectiveness allied to its obtrusive price — $40.69 for a bottle of 60 counts that will last only 10 days when following the intake instructions accordingly — are certainly a let down.